Back in February 2010, Google announced its plans to build out a fiber-optic network for a city in the United States, promising connection speeds around 1Gb/s — 100 times faster than the broadband most people are used to. The announcement led 1,100 cities to apply, and today Google has just announced the winning city: Kansas City, Kansas. For you lucky Kansas City residents, Google has launched an informational page outlining what their plans are (it also provides some background about Google itself). 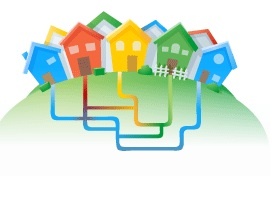 The site’s FAQ says that Google hopes to begin building the network by the end of the year and that service should begin in the first quarter of 2012, with plans to roll out to all communities in Kansas City. Once the service is live pricing will be “competitive to what people are paying for Internet access today” though Google hasn’t yet named the plans. Dont be too depressed if you happen to live somewhere outside of Kansas City, though. In the video below announcing the news, Sergey Brin says, “That’s why we’re rolling out to communities, starting with Kansas City, that are going to give one gigabit of access to every home.” So it sounds like we’ll be hearing about more community launches in the future. And hopefully Google’s roll-out will put pressure on major broadband providers to speed up their fiber roll-outs.